Maria Martinez was born Maria Montoya in 1887/89 and is recognized as one of the most famous Pueblo potters of the 20th Century. She learned the art of pottery making from her aunt Nicolasa as a child and was considered an accomplished potter by her teens. She married Julian Martinez (1897- 1943) in 1904. Originally, Maria made pots and Julian decorated them in the contemporary polychrome style. They demonstrated this technique at the 1904 World's Fair in St Louis, where they sold their pottery for a dollar a pot. This was their first exposure to a broad audience of collectors. In 1907, Julian was hired to help with archaeological excavations on the nearby Pajarito Plateau. Among the polychrome ware discovered were also black ware shards, which Maria saw in 1908 and set out to re-create. 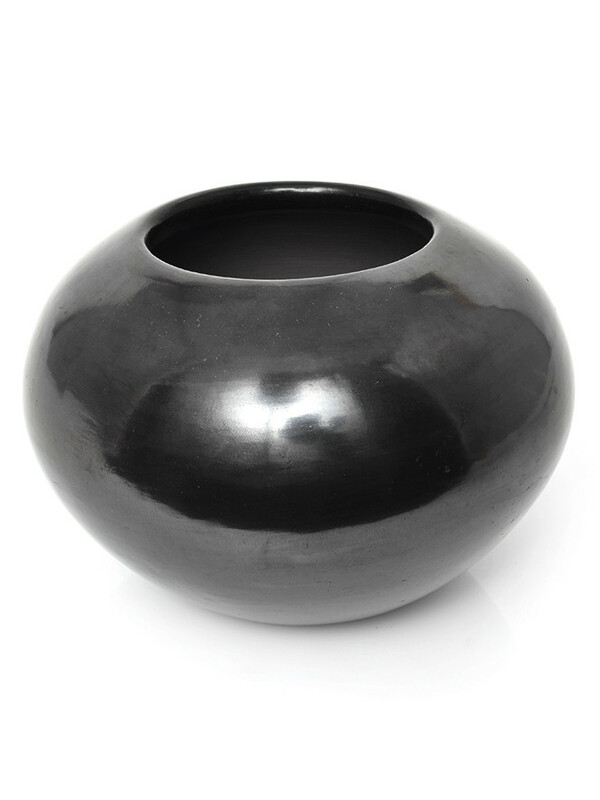 By 1918, through trial and error and much experimentation, they perfected a technique of black on black pottery where the surface design was separated by a matte and polished surface. Maria made the pots and Julian did the decoration. During this period of experimentation, the couple demonstrated for the 1915 San Diego World's Fair and raised the price of their pots to 2 dollars each. In 1925 their new work won "Best of Show" at the New York State Fair and in 1933 they took "Best of Show" at the Chicago World's Fair. Julian and Maria did not sign their early pottery but as their fame grew, they began to sign the work. Originally, only Maria signed the work because pottery was culturally a female occupation. Maria signed the work with just "Marie" from the early 1920's until 1925, thinking it would sound better to western collectors than Maria. From 1925 until Julian's death in 1943, they signed the work "Marie + Julian". After Julian's death, Maria's daughter in law Santana took over the role of decorating and the work she and Marie produced together between 1943-56 was signed "Marie + Santana". 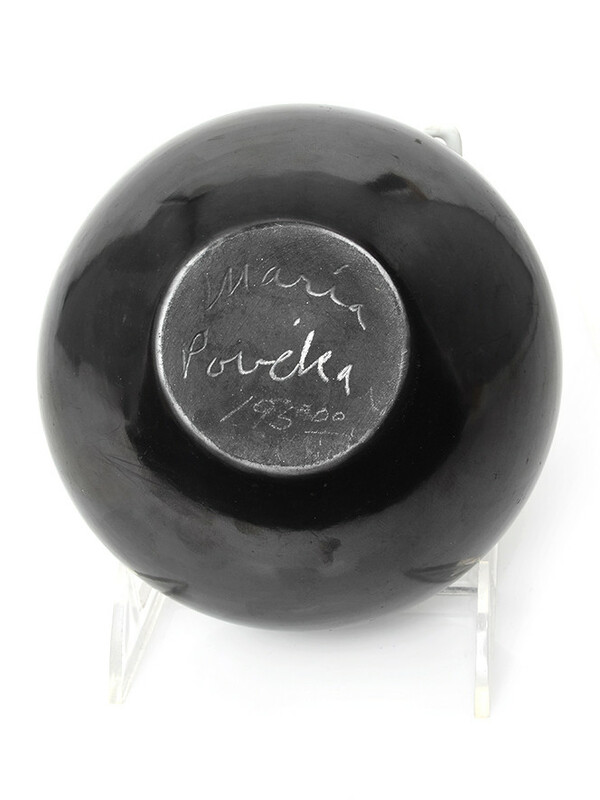 In 1956, Maria's son Popovi Da began working with her and by about 1959, they were signing their work "Maria + Popovi" (or "Maria + Poveka"). Around this time, Maria finally began using her name rather than "Marie". Popovi Da innovated new firing techniques such as the production of sienna colored ware, the two-toned black and sienna ware and the gun metal colored ware. He was also the first contemporary Pueblo potter to inlay turquoise in his work. He was instrumental in helping his mother with her pottery and marketing it. He originated the additional signage of a three number system to her work to indicate the month and year a piece was fired to help distinguish authentic Maria pottery from the fakes. Throughout her life, Maria Martinez gave her time and talent to teach younger artists, promote her craft and educate the world about this time honored tradition. She changed the course of Pueblo pottery and produced a talented family of potters who learned from her and continue to carry on her legacy. Her work can be found in the collection of the Museum of Fine Arts, the Cleveland Museum of Art, the National Museum of Women in the Arts, the Philbrook Museum of Art, and at the Smithsonian American Art Museum. 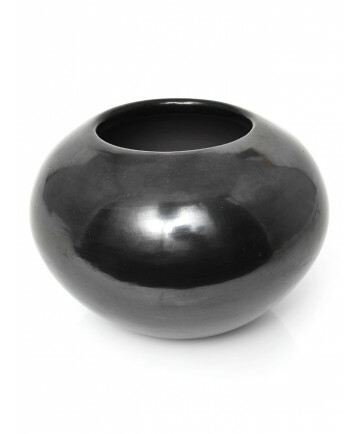 This pot measures 3 1/2 inches tall, 16 3/4 inches in circumference, and 5 1/4 inches in diameter. This item is an consignment item and is not eligible for return or layaway.